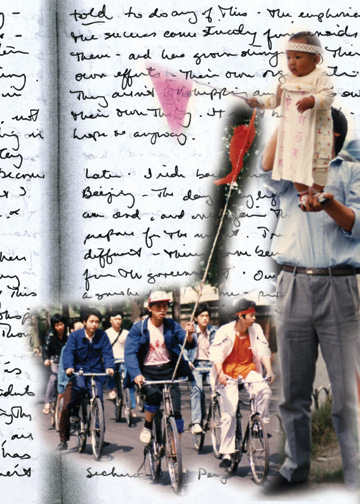 With a bicycle, a notebook, and a little courage, Linnea Searle documented the democracy movement in Tian`an men Square—20 years ago. Today was the funeral of Hu Yaobang. I made plans to go down to Tian`an men Square this morning to watch. Getting to Tian`an men was not easy; there were various roadblocks. But when the square was opened, I ended up smack in the middle of things—not where I intended to be. It was pretty scary there. People would start running. I had visions of stampedes. There were so many people! I asked people what was going on and had various responses. In truth, nobody could really see. There were hundreds of policemen outside the Great Hall of the People and many students standing outside and shouting—probably asking the government to resign. I decided that the periphery was a far better place to be, so I wandered toward the Memorial to the Revolutionary Martyrs. Hu Yaobang died last Saturday. He left office two years ago, but he was the symbol of political change for many intellectuals and students. So the students have taken advantage of the situation to criticize the government—and call for more democracy. The students called an indefinite boycott of classes on Monday—to be ended when the government gives in to their demands. All along the street there were clusters of people trying to listen to the words of students who were relating the events that had occurred outside the Great Hall of the People. They were explaining it because the newspapers had not. Apparently, the students have organized a citywide council of the student leaders—all of this leading up to May 4 [a significant commemoration of the nationalist May Fourth Movement]. Today, there were tens of thousands of students in Tian`an men. It was extremely well organized—and, yes, very exciting. The air simply crackled at the moment that the students marched into the square, holding banners high with a look of confidence and triumph in their eyes. Onlookers cheered the students on, which made them walk even taller, shout even louder. I was also amazed at the government’s response to the demonstration. They made a feeble attempt (according to other students here) at blocking off some roads, but when the students pushed through lines of policemen, the crowds roared approval and the police simply backed off. The government did the best conceivable thing, which was to let the students freely enter the square. Joining the students marching back [to the university] was by far the most interesting thing I did all day. The side of the road was lined with people watching, clapping as the students went by. In every passing bus there were people leaning out the windows, clapping for the students, cheering them on, supporting them. Yesterday, I went down to Tian`an men with Lisha and Hong Feng to see what was going on. The students are on to something new now—a mass hunger strike. By the time we got there, they’d been fasting for 26 hours. I don’t envy them; the direct sun was awfully hot. And for Chinese to fast! In a culture that lives for its food, it’s fairly serious. The scene at Tian`an men was very different from before. There were far fewer people than during either of the previous demonstrations. The mayor of Beijing came to the square at around 2 a.m. to try to convince the students to leave. The students, it seems, are past listening to anyone, so they stayed in the square surrounded by the glare of the television cameras. The students are fortunate in their timing of all of this—it really is quite incredible. First, Hu Yaobang dies just two weeks before May 4, so there is a reason to continue to protest that long. And now, just 11 days after May 4, here comes Mikhail Gorbachev [for the Sino-Soviet summit]. China is in the world’s eye as never before. I read an article in the Far Eastern Wall Street Journal. 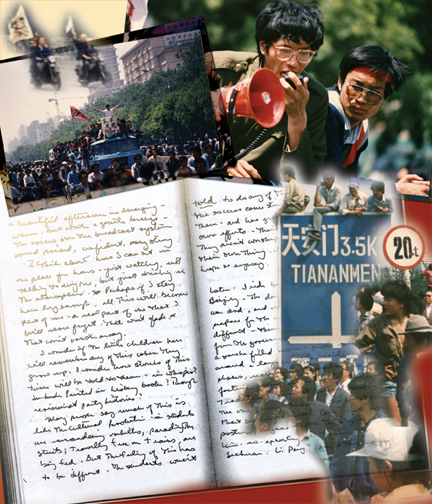 As early as April 24, Deng Xiao Ping was ready to violently suppress the student protests. His plans went so far as to warn local hospitals to expect many casualties on the 27th, the day of the protests. 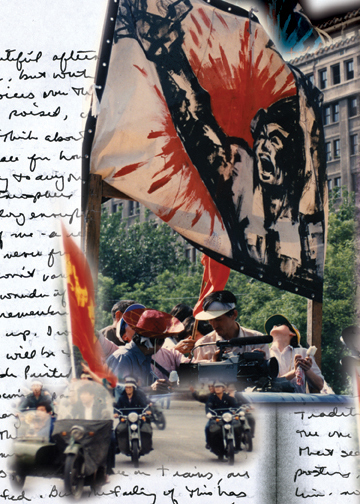 Many students, including my friend Xiao Mei, wrote out their wills the night before, out of fear of what might happen. But it seems that Deng was overruled by other high-ranking cadres. Thank God for that. Beijing—no, China—would be a very different place right now, had the uprisings been violently suppressed. There are people everywhere. The students march past in long groups, the boys dressed in light windbreakers, blue pants, black pants, and the girls, some of them in skirts, brightly colored, carrying bags of water, salt, sugar, fortifications for Thursday. The square is jammed with people. The focus is the large circle surrounding the student hunger strikers. Lines of people surround the circle, trying to peer in. In the circle, very quiet, subdued students sit in the blazing heat of the sun, water bottles next to them. Some lean over to talk with friends, but most sit quietly—on their faces is a mixture of boredom and defiance. Now, I am directly in front of the Great Hall of the People. The students have formed a path for the ambulances transporting those who have fainted. A few run back and forth ordering people to move; in my case, though, they ask politely. An old man walks by with a long beard, holding signs. The students applaud him as he passes. I asked Xiao Mei yesterday, “What does the government have to do to get the students to eat, to break the hunger strike?” They have to say the students are right, and they have to initiate a dialogue with the students on equal footing. “But how?” The first is a concrete task, but the second is so subjective. The government has been holding talks with student representatives for two days; from all accounts the students are not convinced that it is on equal footing. How can it be? All of a sudden, a banner appears. My companions look at me; excitedly tell me that it’s workers! Probably the first ones. Everyone runs forward. Seeing workers striking adds a new element. It’s spread, it’s not just students, it is academics, perhaps some workers, even if only a few, but the significance far overshadows the numbers. I climb on one of the carts to see the whole scene. It’s amazing. There are people everywhere. A sea of heads, flags, banners in every direction as far as I can see. Every direction I look, I see every kind of person. Young, old, in suits, in jeans, in jogging outfits. And children. So many children! Babies! Obviously, people aren’t afraid. Workers, middle school students, reporters, doctors, teachers, everyone is here, clapping, shouting, urging the demonstrators on. And the signs! LiQiu would read them and exclaim “ay ya!” Still no sign of police anywhere. Today’s marchers included Security Bureau workers—in uniform! Young Pioneers—youth Party members! It’s as if everything that had been inside these people for 50 years has come bursting forth in one breath! A breath that grows stronger and bolder with every minute that passes. The sun is almost down behind a cloud on the horizon. The sky is a dusty blue. Mao’s mausoleum is clearly outlined. So static, unmovable, almost in total contrast to the movement and color on every side. It almost appears to be standing in defiance—watching the scene, frowning, isolated. A group of demonstrators on motorcycles drive past. Everyone around me gets up and runs to the road. The spectacle over, they now move up the square. It’s amazing how crowds form and dissipate. It makes the whole square appear elastic. Shapes form, change, move. Back at the dorm. Trying to calm myself down. Late night musings while listening to Simon & Garfunkle. My sunburn hurts, blistering under the heat. But far too excited to sleep. Hoping that writing will bring me back to myself, I try to make sense of what has happened in the past few weeks. I’m getting scared now. Everything is on the verge of chaos. Even the student leaders are beginning to think that the public demonstrations are getting out of hand. All it will take is the death of one of the hunger strikers and that’s it. All will fall apart, and the minute that happens no doubt the tanks will begin to roll. There are ominous signs. I went to LiQui’s dorm last night as I have done practically every three days for months. The entrance was locked, so I went to the next entrance and there were two men sitting outside who asked me to register. They wanted to know the name of the person I was visiting so they could see if she was there. Deeply disturbed, I left. I don’t want to cause her any trouble. I guess this isn’t the time to be flaunting Sino-American friendships. A fever is the only way to describe it. Demonstrators throw bottles out of trucks. Deng Xiao Ping—a play on ping, which also means bottle–smashing bottles to symbolize the smashing of Deng Xiao Ping. I saw an old woman, perfectly white hair, creased face, raising her hand to give the victory sign to passing protesters. Is she really supporting them? What must she have seen in the last 70 years? Does she think it’s just the same—or is this something different? I’m at Moira and Michael’s house, listening to the BBC on short-wave. It’s happening, right now: 1,000 trucks full of troops are moving towards Tian`an men. According to the BBC, a million people are at Tian `an men. The goal of the students is simply to provide so many bodies that the government cannot come through. Part of me is tired and just wants to go to sleep. That’s the body part. But my mind is on! What I really want to do is get on the bike and ride down to Tian`an men to see what’s going on. Did I mention that the hunger strike has been called off? At least temporarily. Earlier, the students were unsure, but almost an hour ago the BBC reported that there was an announcement at the square. Martial law has been declared. The first troops were blocked from coming into the square by the students, who let the air out of their tires and stopped the convoy by holding hands and standing in front of the trucks. Earlier today another convoy turned around and left. Soldiers shook hands with the students, left with smiles on their faces, declaring that they are the people’s army. But, according to the last BBC report, armed troops are massing southwest of the city. The people—students—are still packed into the square. It’s going from bad to worse. Armed guards have met students at the Luili Bridge. The students are pleading with the soldiers not to continue—to turn back, but as of yet, they haven’t. The students are also climbing on top of the vans and reading out a petition in support of Zhao Zi Yang—who apparently has resigned. CNN has been forced to stop its live broadcast. A general curfew will go into effect tonight at 10. It’s a very different Beijing than the one I’ve been away from for two days. The mood is now subdued, serious. The city is under the control of the students now. Every corner is manned by students stopping cars, examining drivers, convincing those with no business in the city to return home. The leaders may have attempted to impose martial law, but thus far those attempts have been in vain. The question now revolves around the patriotism of the People’s Liberation Army (PLA)—the 18- and perhaps 16-year-olds who will be sent in to suppress the uprising of their own people. If the students and the people of Beijing can convince them to turn around, then they have won. On the square itself, the mood is subdued, a combination of the afternoon heat, the tension of previous nights, and wondering what is to come. The flags and banners are still waving. One man, a worker, possibly from the countryside, dark-complexioned and quiet, shyly walks to the students and hands one young woman a bag of bread. He turns and walks away, quietly listening to the thanks as he strolls away. It’s coming; this time it’s really coming. I see the pictures on TV, and it’s ripping me apart. I see Tian`an men—it feels as if I’m looking at my home, a place that is so familiar to me, but that may be over soon. The government has given the students—the people—until dawn, and the general feeling is that tonight will be the night. I’m scared—not for myself, but more for the loss of what was this week. So much enthusiasm, joy in the people at being able to express themselves. It may all go—oh! What can I do? I want to go outside to be a part of it, but it’s not my country, not my place to be out there. I’m holed up in Mom’s hotel room, waiting. 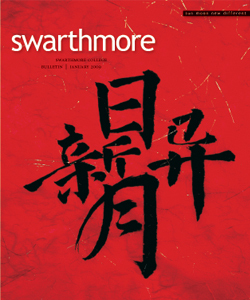 [The author’s mother, Barbara Wolff Searle ’52, was visiting China during the last weeks of her daughter’s term there.] According to CNN, one million people have gathered in Tian`an men. One of the student leaders has said that if the government wishes to remove the students from the square, it should do it through a dialogue with the students, in a democratic fashion. However, if the authorities decide to use force, they cannot and will not resist. The latest news report says that there are still major decisions with the top party members about what to do about this situation. That was good news. Perhaps there are reformers voting for more restraint. But still . . . a million people in Chang An and Tian`an men is too many. There’s no room to move, and nowhere to go. Down at Tian`an men again. I’m sitting next to the fence that separates the square from the Great Hall of the People. Gone is the tension that enveloped the city yesterday. Rather than students, some intersections are now manned by PLA and city policemen—not as a military presence, but simply as if they are doing their normal jobs on a Monday morning. The streets are alive with everyday vehicles. The barricades are gone. Cars are no longer being stopped. Along the route however, there are many students, looking tired and dirty but relaxed and calm. Even Tian`an men, although not quiet, seems fairly relaxed. The appearance of the square brings home the length of this ordeal. The banners are not flying as high; signs are drooping. But the speeches continue, the applause grows louder and more frequent. I catch a few words such as “freedom” and “democracy.” Across from me, a student writes in a journal like mine while his companion sleeps. The students secured a victory with last night’s continued stalemate. With every hour—particularly every night that the government remains incapable of moving—its credibility erodes. 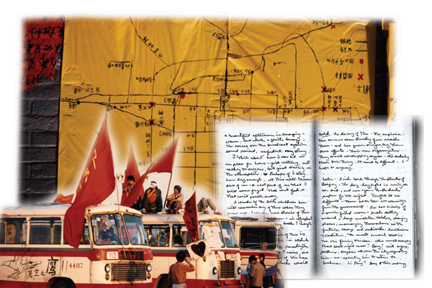 Troops are massed on all sides of Tian`an men, but the government is not acting. There must be intense struggles in the higher echelons of the Communist Party. There are moments when, all of a sudden, you realize that your lips have formed themselves into a huge smile. Your heart longs to sing out. That’s what this moment is to me right now. The march has begun again to the heart of the square. The New World Symphony is being played over the loudpeaker system. Students are lined up on top of the buses filling the square, waving their banners. Everywhere is the sound of cheering, clapping. Euphoria—downright euphoria! I think about how I can sit in one place for hours just watching. Not talking to anyone, just drinking in the atmosphere. Perhaps if I stay here long enough, all this will become part of me. A real part of me that I will never forget, that won’t fade away, that won’t vanish. As night falls, there is uncertainty. The barriers are erected; the streets brim with people, students in the road, onlookers gathering around the sides. Trash cans, roadblocks, all moved into place. Back home. Again it seems that the crisis is over, that the tide seems to have turned. For another night there was nothing—some clashes between students and troops, but nothing major. Yesterday, more than 100 top military officers submitted a letter to Li Peng saying that they would not order their troops to fight against the Chinese people. The crisis, it seems, is over. But is it? Or has it—in a very fundamental sense—just begun? 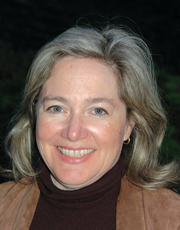 Linnea Searle ’84 has an M.B.A. from Berkeley. In addition to her travels in China, she was a Peace Corps volunteer in Cameroon and maintains an interest in international development. She has worked in both the corporate and not-for-profit worlds and is currently consulting on a project involving mobile phones in Africa. She lives in San Diego with her husband and two sons. I like your post on Tian ’an men Diary.thanks for posting.